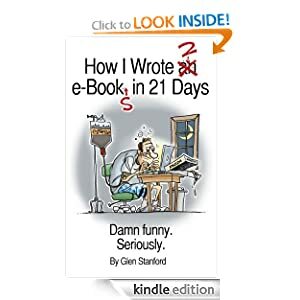 Scott's plan in "How to Write a Nonfiction e-Book in 21 Days!" works of genius. This is the true story. have to worry about Chuck getting angry with you at the same time. if I used his name without permission. The Good Book says "A joyful heart is good medicine" (Proverbs 17:22). pick your quotes from this 1700-year-old classic. While I might dance around some edgy subjects, I never want my readers to squirm. I leave that to the Ben Stilers of the world. always leaves you with a chuckle. better, but honest humor shouldn't have to rely on shock jock laziness. sell my books for the price of a cup of coffee, so what do I know? only one taking the tickets. and I'm #%$#&! using it. stuff to uncover them. Think of it as a treasure hunt.